I love reading translated works; I devour them. There’s a whole other world of literature outside the U.S. waiting to be read, and I mean to discover as much of it as I can. Translating Music, first of The Cahier Series published by Sylph Editions, is written by translator Richard Pevear, putting a whole new slant and appreciation on the way I perceive translated literature. The first portion of this 35-page cahier is Pevear’s translation of the poem “The Tale of the Preacher and His Man Bumpkin” by Alexander Pushkin. Part Two discusses the work of a translator and how every translator presents the same text differently and why. Pushkin’s poem contains his sketches and presents the work in its original Russian text on the left hand pages. On the right are Pevear’s translations. This merges well with Part Two as now the reader has had a taste of translated text. I’m the first to admit I’ve been sloppy in the past about choosing translations. I never gave a thought to who translated my copy of War and Peace. But Pevear explains simply and clearly why one translation may be vastly different from another. Using several examples from Tolstoy’s War and Peace, the author gives the reader a whole new look and appreciation into the world of a translator. Sylph Editions has published The Cahier Series in association with The Center for Writers & Translators at the American University of Paris. 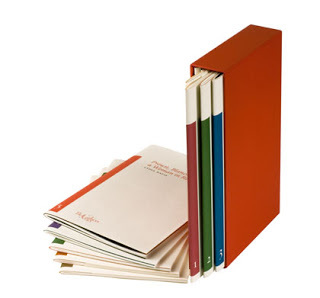 The series includes two “books” or sets of cahiers, each containing 6 volumes. Sylph has kindly sent me the entirety of Book One for review, and I’ll be sharing a new cahier with you every few days. You can order The Cahier Series by visiting any of the links in this post. I’m OCD about choosing translations; I easily spend half an hour researching it, lol. Of course, for Russian lit I go straight for Pevear & Volokhonsky! And I love Pushkin. In second year Russian, I had to memorise fifteen or twenty lines of “The Bronze Horseman,” and I still love saying them to myself. It was so neat to see the school he attended outside St. Petersburg, as well as visit the museum they made out of his house! Ok, I’m going to stop gushing now. But this sounds like a really neat book/series. Hi Eva! Sounds like you know your stuff! And how cool that you got to see Pushkin’s school and house. Just the sort of thing I like to visit when traveling. Now, that’s really getting into reading. I can tell you, next time I head for some Russian Lit I’m looking for Pevear. I really enjoyed the Pevear and Volokhonsky version of Anna Karenina. I am looking forward to getting their verson of War and Peace at some stage too! Select Category Art Books Blog Talk Book Giveaway Book Giveaway Winners Book Review and Giveaway Book Reviews Book Talk Canadian Fiction chapbooks fiction Goldfish Award Books Independent Booksellers Interesting Links Interviews latin american literature Memoir mysteries Podcasts Poetry Self Help Books short short stories short stories Small Presses Spanish Literature Swedish Literature The Cahier Series Thrillers Travelogues Uncategorized What is carp(e) libris? Sweepstakes Advantage - Free Online Sweepstakes Win Instantly! carp(e) libris reviews is running on a WordPress engine, with a WhitePlus body kit developed by Militaru.